Habitat: Mountain, Riparian. This beautiful wildflower grows along shady to partly shady streams and in other moderately moist areas in the mountains. 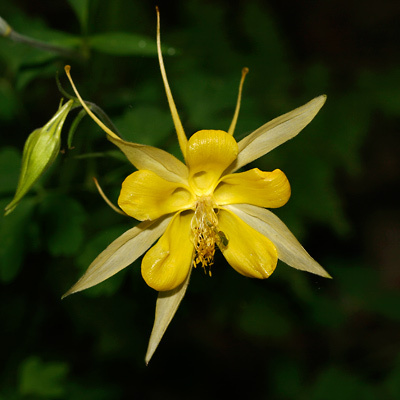 If provided with shade and moist soil, Golden Columbines can be grown as garden plants at lower elevations. Description: The flowers are up to 3 inches (7.6 cm) across and have 5 longer, pale yellow, lanceolate sepals and 5 shorter, oblong petals with slender, evenly tapering, up to 2 1/2 inch (6.4 cm) long, nectar-filled spurs projecting behind them. 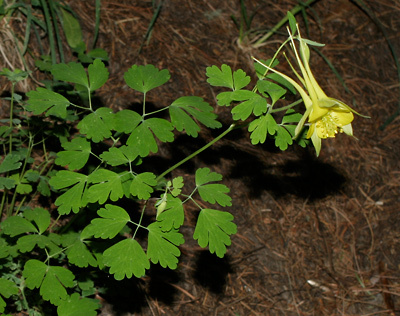 The leaves are green and divided into 2 (rare) or 3 delicate, round-lobed or toothed leaflets. The stems are green and very slender, giving this plant a light, airy appearance. 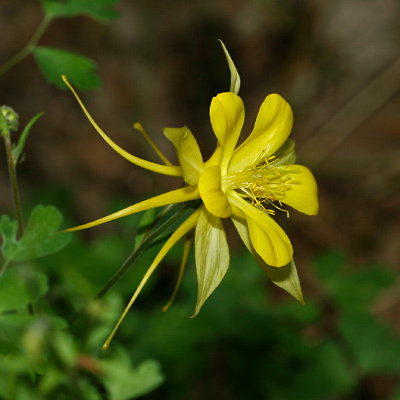 The similar Longspur Columbine (Aquilegia longissima) has flowers with spoon-shaped petals and much longer spurs that can be up to 7 inches (18 cm) long. Butterfly Plant – The flowers attract butterflies and hummingbird moths (their main pollinators).